Sleepy Hollw Bed and Breakfast is a relaxing mountain Inn located between Asheville and Black Mountain, NC, Just off I-40 in Swannanoa, NC. Nestled between the Blue Ridge and Great Smokey Mountains, we are located just seven miles to Asheville's historic Biltmore House and WNC area mountain attractions. Our Charming two story home built in the early 1900's, has seven rooms and private baths, air conditioning and suites to accommodate two couples or larger families. The house has been lovingly restored and decorated by the current Innkeepers, Clayon adn Danrae Babbitt. A 2000 square foot addition was built in 2002 in order to provide modern comfort and private bathrooms for each bedroom. 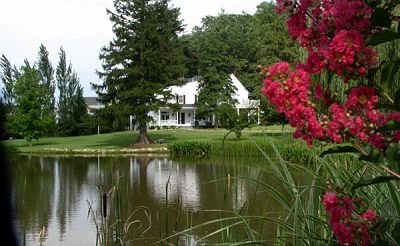 Our home with five scenic acres is an ideal location for outdoor and indoor weddings, social events, reunions and business meetings.